Steak Salad is a hearty lunch or dinner to make your mouth water! 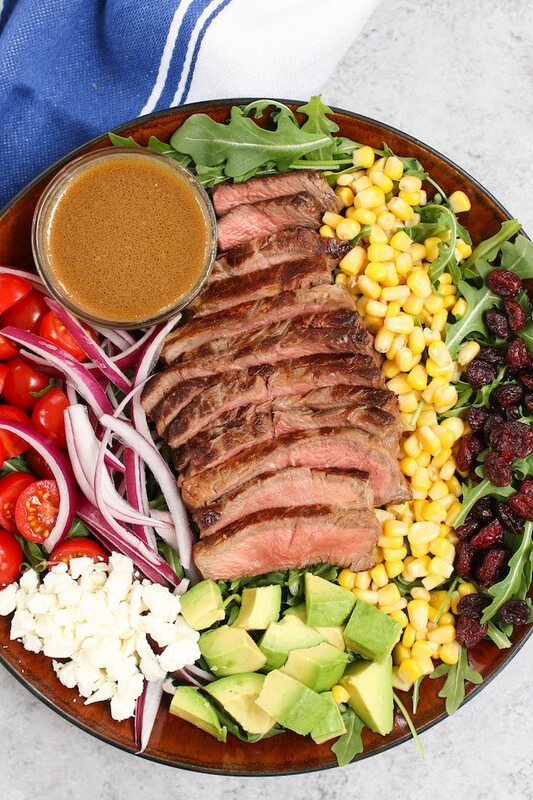 This flavorful steak salad recipe combines juicy, pan-seared steak with fresh vegetables and a balsamic vinaigrette dressing. 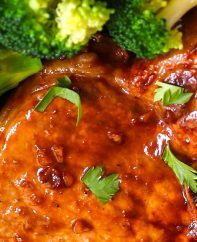 It’s a perfect keto meal on its own, or can be served on pasta or wrapped in tortillas. 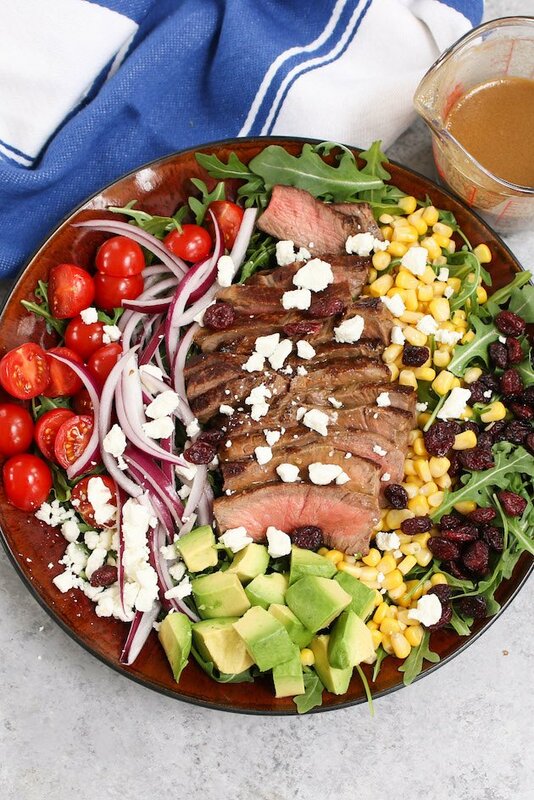 Look no futher for a healthy and simple steak salad recipe that’s always a hit! It’s one of my go-to potluck or picnic dishes along with BLT Pasta Salad, Mango Salad, and Pulled Pork Sandwich. Steak salad is super easy to make and a delicious low-carb meal. Plus, it’s a great make-ahead recipe for grab-and-go lunches during the week. 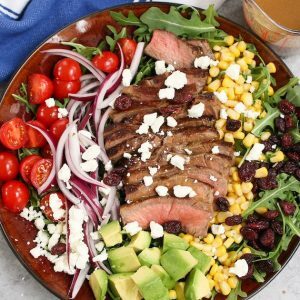 Classic steak salad is made with pan-seared or grilled steak, mixed greens, red onions, cherry tomatoes and goat cheese with balsamic vinaigrette dressing drizzled on top. 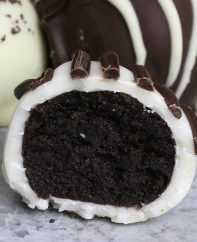 It’s the perfect dish to bring to a get-together. 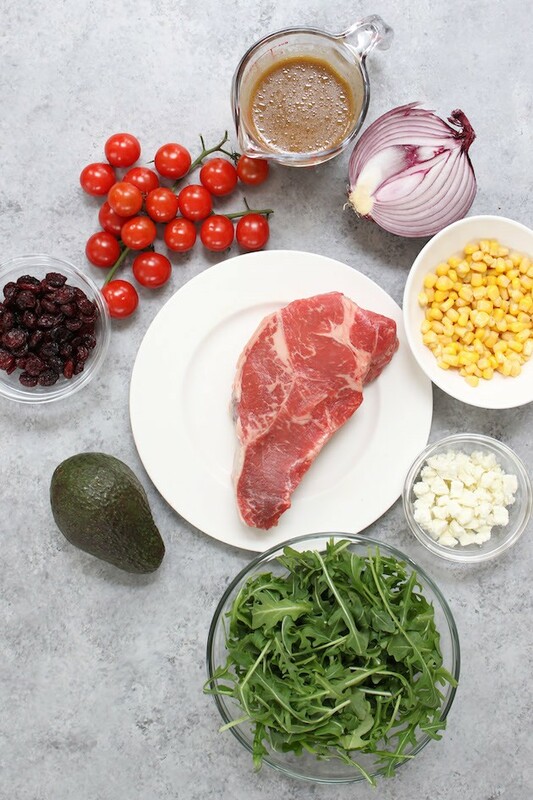 You can also add other ingredients such as arugula, avocado, dried cranberries and corn. 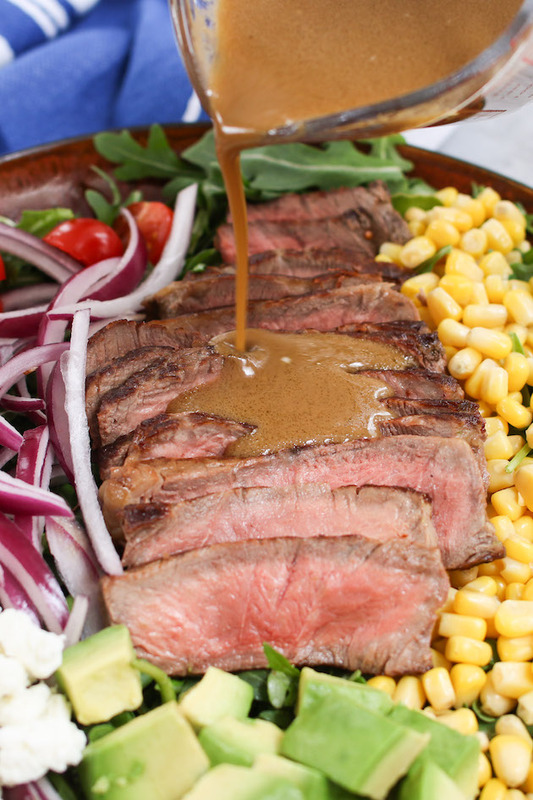 The best thing about this steak salad with balsamic vinaigrette? It’s the perfect make-ahead dish with less than 20 minutes of prep. WHAT ELSE CAN BE ADDED TO STEAK SALADS? WHAT STEAK DO YOU USE FOR STEAK SALAD? Look for tender cuts such as sirloin steak, rib eye, T-bone steak and strip steak. My favorite is sirloin steak for its rich flavor. I like to pan sear the sirloin steak with salt and pepper, and you can find the complete instructions in Pan Seared Sirloin Steak post. For a steak salad recipe, cook the steak to medium-rare to a temperature of 130°F (54°C) for the best texture. Be sure to let the cooked steak rest for 5 minutes and cut crosswise against the grain for maximum juiciness. My favorite steak salad dressing is this balsamic vinaigrette dressing. 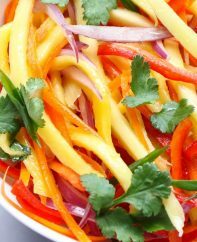 The acidity in the dressing breaks down the proteins, resulting in a much more flavorful salad! 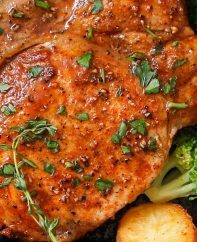 It takes about 5 minutes to make with just a few simple ingredients: balsamic vinegar, Dijon mustard, garlic, olive oil, salt and pepper. 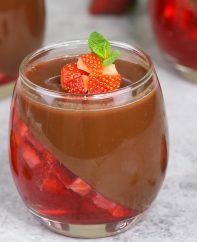 This combination creates the most delicious steak dressing which is delicate and tangy with just a hint of sweetness. HOW LONG DOES STEAK SALAD LAST? This steak salad will last for up to 4 days in the fridge when wrapped tightly with plastic wrap. Store the salad and dressing separately in the fridge if you don’t plan to eat right away. Bring steak to room temperature before cooking: Let steak sit at room temperature for 30 minutes before cooking. This makes the cooking time more accurate. 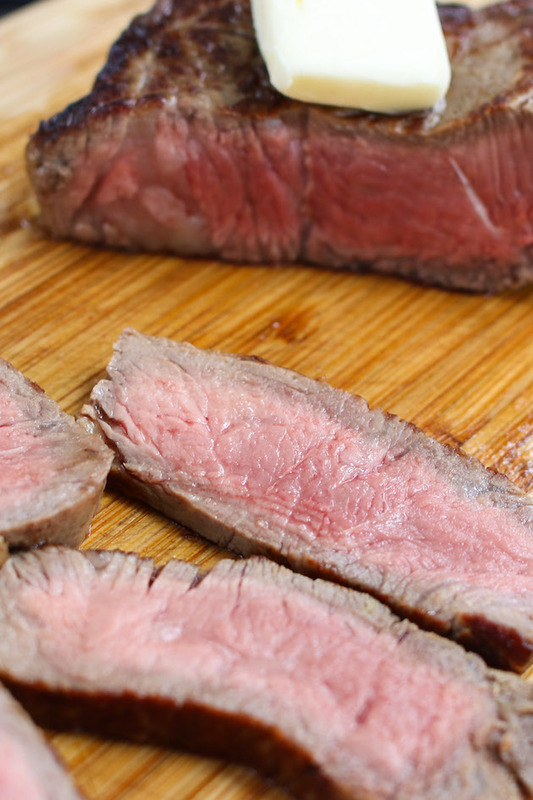 Don’t overcook your steak: It’s important to sear your steak properly for the best texture. Overcooking steak will make it chewy. 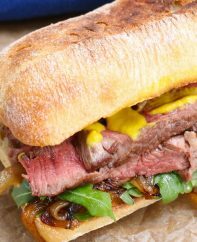 Let seared steak sit for 5 minutes before cutting into it: This allows the juices to settle and distribute before serving, resulting in more flavorful steak. Keep it colorful: Add colorful ingredients such as mixed greens, cherry tomatoes, corn, etc. for a colorful dish. 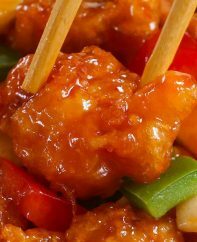 Balance the flavor: Add dried cranberries or raisins to the salad so that you will get balanced sweet, sour and savory flavors. Place a large cast iron skillet over high heat for 1 minute. Add oil and the steak. Fry for 2-3 minutes and then flip. Fry on the other side for 3 more minutes until nicely browned with an internal temperature of 130°F (54°C). Remove steak to a cooling rack and let rest for 5 minutes. Then slice thinly. To a large plate, add other ingredients and then arrange the steak slices atop the salad. Drizzle balsamic vinaigrette over the salad and toss to combine all ingredients. 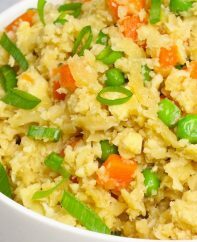 Taste and see if it needs more dressing or any adjustments. Serve immediately. Make sure to let the steak rest for about 5 minutes before cutting. You can add honey to your balsamic vinaigrette dressing if you prefer a sweeter flavor.